Aging comes with a variety of unique health concerns and complications, and as you get older, you may need to make changes to your oral health routine. It is important that you continue to take good care of your teeth, gums, and dentures as you age, and doing so can prevent future oral and overall health problems. • Darkened teeth. This is often caused by changes to the dentin found under the enamel as a result of a life of consuming beverages and foods that stain the teeth. • Dry mouth. A result of reduced salivary flow, seniors are especially susceptible to developing dry mouth because of the side effects of medications, certain cancer treatments, and diseases like Sjogren’s syndrome. • Gum disease. Most commonly a problem for older adults, gum disease is caused by plaque, and it can be worsened by poor-fitting dentures and bridges. • Tooth loss. Untreated or uncontrolled gum disease can often result in tooth loss. • Thrush. Certain drugs or diseases that affect the immune system could trigger an excessive growth of a certain fungus in the mouth. • Denture-induced stomatitis. Poor dental hygiene and ill-fitting dentures can cause this condition, which involves inflammation of the tissue that is found under the denture. Dentures are a common reality for a variety of seniors, and they help patients who have lost teeth to speak and eat normally. Without teeth in your mouth, your facial shape could change, and dentures can improve both your health and your appearance. Like real teeth, dentures can accumulate plaque and stain, so it is important to take proper care of your appliance. Each morning, it is important to brush and massage your gums before you put in your dentures. This will stimulate blood circulation, and you should use a soft-bristled brush to prevent gum irritation. At night, make sure that your dentures are submerged in warm water or a denture cleaner to stay moist, as soaking your dentures will help them to stay clean. You should be sure to rinse and brush your dentures off when you remove them from the water in the morning, and if ever you notice a crack or another problem, be sure to contact your dentist to have them examined. • Have you noticed any recent changes within your mouth? • Have you noticed any sensitive or loose teeth? • Have you been having any difficulty with swallowing, chewing, or tasting? • Do you have any pain, sores, bleeding, or discomfort in your mouth? If you wear dentures or have any other appliance in your mouth to improve your smile after tooth loss, your dentist will likely ask you about them, as well. You may be asked to take the appliance out if it is removable so that it can be inspected for signs of a problem, and your dentist will also look for signs of irritation or other problems in the area of the mouth touched by the appliance. 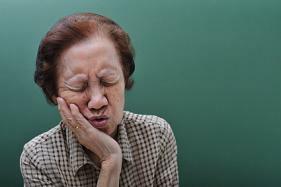 Please contact us if you have any questions about seniors oral health problems.